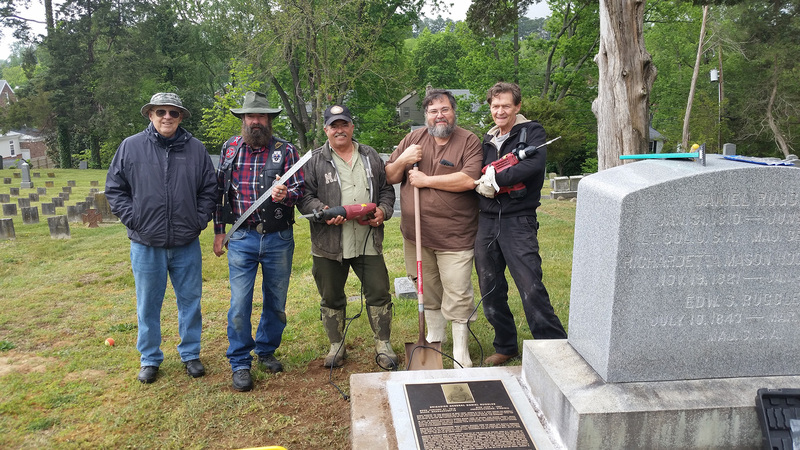 On April 30th, 2016, a combined team of compatriots worked at the Fredericksburg, VA Confederate Cemetery and placed two large memorial stones with brass placards containing life stories for General Officers interred. A total of six memorial stones will be placed to complete the project. The Fredericksburg Ladies Memorial Association purchased the stones and the Matthew Fontaine Maury Camp 1722 purchased the brass placards. The team consisted of (left to right) John Johnson, MOS&B Chapter 258; SCV 1Lt Commander Greg Randall, Stafford Light Artillery; MOS&B Chapter 258 Commander Chris Ezelle; SCV Commander Bill West, Beverly Tucker Lacy Camp 2141; SCV Commander John D. Martin Jr., Matthew Fontaine Maury Camp 1722. Photo taken by MOS&B Chapter 258 Past Commander Charlie Embrey, Sr.